The mushroom cloud from a GBU-43/B, also known as the Massive Ordnance Air Blast (MOAB), can be seen rising in this Air Force video still image after it was launched successfully from a MC-130E Combat Talon I aircraft on Friday. The 21,700-pound bomb was dropped from 20,000 feet to reach its target on one of Eglin's test ranges. 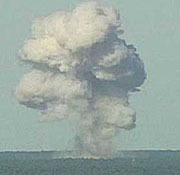 Upon detonation, it created a plume over the Florida Panhandle that rose more than 10,000 feet and could be seen from 40 miles away. The British capital, this week, witnessed the biggest-ever protest march held on a week day. It was to protest against the war in Iraq, the illegal occupation of that country, and against the presence in the country of the US President, who along with the British Prime Minister, were described by many among the marchers as war mongers who needed to be tried for their war crimes. The opposition leader Mikhail Saakashvili and his supporters stormed into the Georgian parliament today, interrupting Eduard Shevardnadze’s speech. The Georgian leader was taken from the hall by his bodyguards, and Saakashvili took over the podium. Georgian opposition supporters shout as they go to the Parliament building in Tbilisi, Georgia, on Saturday. Opposition supporters broke down the door of Georgia's Parliament building and entered the chamber where President Eduard Shevardnadze was giving a speech. 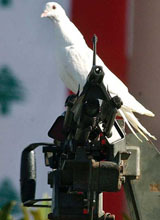 A white dove perches on a machinegun at a function to mark Lebanon's 60th Independence Day in central Beirut on Saturday. The Lebanese army held a military parade in Beirut that was attended by Lebanese President Emile Lahoud. THIS is certainly a long week for Pakistan’s foreign policy makers. The country wishes to dress up a new policy. If the media reports correctly assess the high profile meetings in Islamabad, Pakistan should be redefining its relations with the big powers and of course with its neighbours. 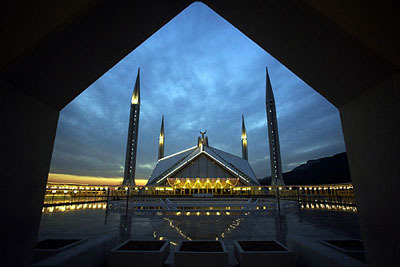 Islamabad's Faisal Mosque is bathed in light on the 27th night of the fasting month of Ramzan, in Islamabad on Saturday. An MC-130 Combat Talon dropped the 9,800-kg satellite-guided GBU-43/B Massive Ordnance Air Blast Bomb, or MOAB, onto a test range at Eglin Air Force Base in northwestern Florida, said Jake Swinson, a spokesman for the Air Armament Center at the base. The MOAB, the most powerful non-nuclear US bomb, carries 8,482 kg of high explosives, detonating just above the ground when the tip of the 9.1-metre-long bomb hits the earth, Swinson said. Swinson said it was the final of four developmental tests for the MOAB — nicknamed the “Mother of All Bombs’’ by some in the military — but only the second in which it was detonated. The previous live test on March 11 followed two inert tests. Over 100,000 took part in the march. They came from all over the country and represented all sections of the society. The protesters included school and college students and teachers, housewives, small business men, lawyers, councillors, members of parliament, pensioners and disabled persons, some on wheel chairs. They were people belonging to different races, different colours and different religions. The only thing common among them was that they were against the war. This was the second massive rally against the war this year. 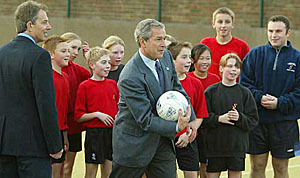 The first was held on February 5 before US-UK forces invaded Iraq, without UN approval. A million people joined the rally at that time. Asked by TV reporters as to why they decided to join the present march, the participants said their voice was ignored earlier but they wanted to show their anger and anguish against the continued occupation of Afghanistan and Iraq. They also wanted to protest the invitation to the US President to visit the UK, which they felt was an insult to the good people of Britain. The placards and banners the protesters carried described Mr Tony Blair and Mr George Bush as terrorists. When told that these leaders were fighting terrorism and terrorists and working for democracy and freedom, their reply was that they considered these leaders terrorists and war mongers and wanted them to be tried for war crimes. Many protesters said they were protesting against other American policies, such as its opposition to signing the Kyoto protocol to protect environment, and refusal to endorse the European Court to try violation of human rights and genocide. They were also protesting against double standards, free markets in the rest of the word but protection for American markets. Parts of London came to a complete standstill. The high point of the rally was the bringing down of the 40-ft high statute of Mr George Bush, replicating the scenes in Iraq when Saddam Hussein’s statute was brought down signifying the end of Saddam’s regime. The organisers of the march had won a court victory against the police which had earlier banned the protesters from marching past the Whitehall and Parliament Square. The fact that while tens of thousands marched to show their anger against the President’s visit, the first-ever state visit to Britain by the American President in over half a century, was not welcomed by cheering crowds either on the day of his arrival or the day when he was formally welcomed by the Queen. The massive police operation was mounted to keep the protesters away from the visiting US. The queen’s banquet was overshadowed by news of the serious breach of Palace security by a newspaper reporter who managed to get employed as a footman having access to all parts of the palace. While the Lord Mayor’s banquet was being held in the city of London, the Mayor of London decided to boycott it and, instead, hosted a reception for the anti-war protesters. The Mayor, Mr Ken Livingstone, said that the US President was not legitimately elected. It was also a day when the government was dealt a humiliating blow by its own back benchers when the bill for the reform of National Health Service was passed by 17 votes as against the government majority of 161. It was later sent back by the House of Lords, to be passed again by the House of Commons in the wee hours of the morning. The government heaved a sigh of relief when the Lords finally relented and allowed the legislation to go through. The opposition leader Mikhail Saakashvili and his supporters stormed into the Georgian parliament today, interrupting Eduard Shevardnadze’s speech. The Georgian leader was taken from the hall by his bodyguards, and Saakashvili took over the podium. “The velvet resolution has taken place in Georgia,” Saakashvili said, as the hall applauded him. 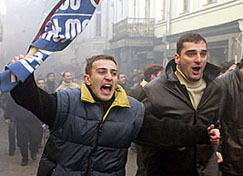 Hundreds of opposition activists had stormed the hall minutes after Shevardnadze convened the newly elected parliament. This poverty-stricken ex-Soviet republic had slid into its biggest political crisis in years after the November 2 parliamentary elections, which the opposition and many foreign observers claimed were rigged. The election has fueled popular anger against Shevardnadze’s government and led this impoverished nation into its biggest political crisis in years. As the bodyguards led Shevardnadze out of the hall, the 75-year-old Georgian leader almost tripped. It was not immediately clear where he was taken. Saakashvili ordered the pro-government lawmakers to leave the hall, and handed over the speaker’s podium to opposition leader Nino Burdzhanadze. What is causing worry is the terrorists attacks in Istanbul and other countries over the past some weeks. This week, Pakistan banned more terrorist outfits. It sealed offices in Sialkot and other places and as the Dawn reported, the President was worried about the worsening situation in the NWFP and Baluchistan. But as far Kashmiri militants are concerned, the official line is that they are freedom fighters. Musharraf is trying to reassess the response of the countries like the United States, England and other big powers. But the greatest worry is whether the Indian Prime Minister would attend the SAARC meeting in January or not. Other issue is sending troops to Iraq as Pakistan is under pressure. The Dawn also warned that,” The attacks on Turkish cities show that Al-Qaida has specifically targeted a country that is a US ally. For that reason, Pakistan, too, must tighten security measures, for Al-Qaida has been incensed by Islamabad’s role in the war against international terror.” The government, in fact, has tightened security for most embassies.